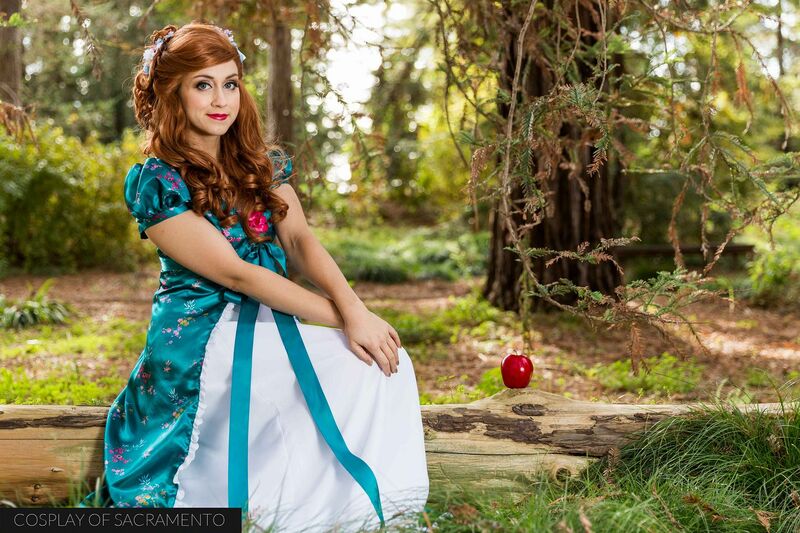 On Monday October 24, 2016 a group of cosplayers went out to the Sacramento SPCA on Florin Perkins Road to do a very special photoshoot. 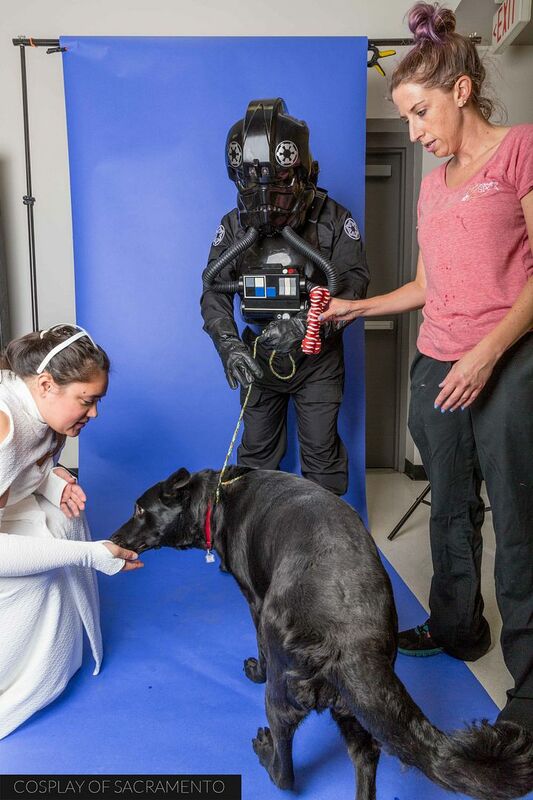 The goal was to capture photos of the cosplayers in their Star Wars cosplays interacting with animals looking for a home. The photos would be used as promotional media in order to call attention to these animals in need. I've done a few of these SPCA shoots these past couple of years, and each time it is a tremendously rewarding personal experience for me. Today was no different. It was an honor and a privilege to be the photographer here today. We mainly took photos of the dogs and cats at the center. Most of the animals we took pictures of were brought to a room with my photography rig. One of the assistants at the SPCA would come and bring us an animal one at a time to photograph. 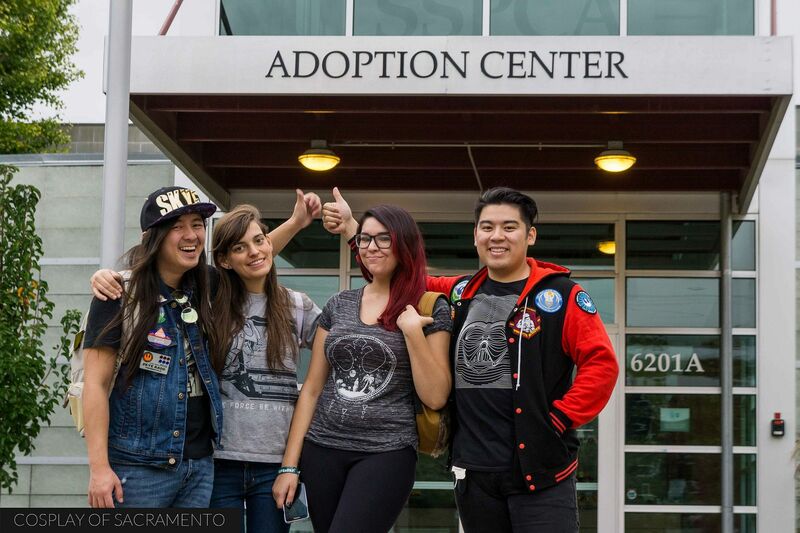 Some of the cats, however, didn't want to leave their cozy cat room... so we went to them! 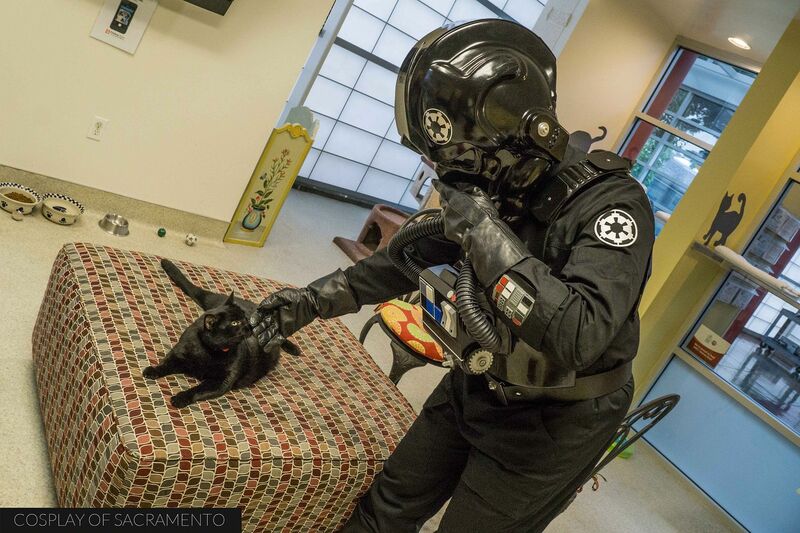 Here's a photos of a cosplayer in Tie Fighter Pilot gear saying hi to a beautiful black cat. I have to say these two really make a nice pairing. This cat would fit right into the color scheme of any Tie Fighter Squadron! This is a photo of Tayla, the person who really gets a lot of these cosplay functions together. I always appreciate the hard work she does in organizing these events. 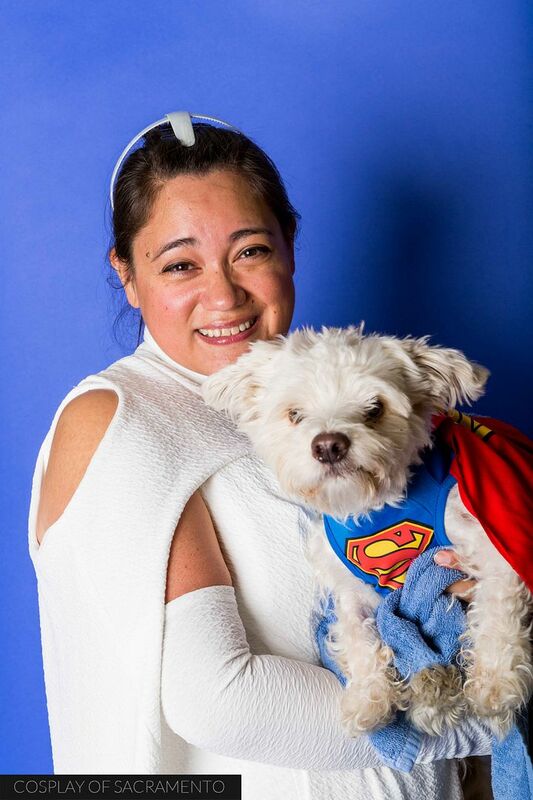 Talya connected the cosplayers with the SPCA and did an amazing job at making everything run smoothly. I know a lot of work has to go into making these shoots go well. She even provided snacks and water for us all during the photo session - see how awesome she is? It's a joy to work with her, and I really want to give her the recognition she deserves! This shoot was a total team effort. It can be difficult to get the animals perfectly lined up and ready to take photographs. I appreciated the assistant from the SPCA as well as everyone else who rolled up their sleeves and helped get the animals into the right position. It was my goal to try and capture 2-3 nice photographs of each animal that came through. For some animals I was able to get a number of shots whereas others I was glad to capture just one. In the end, I was happy that all the animals were able to get their photograph taken with a cosplayer. I really hope that this shoot will help these needy animals a great new home with loving caretakers. All of the animals I had the chance to photograph were so adorable. I could see them all making great pets for any family. Just go to the SPCA and check out the animals that they have there. They will melt your heart and make you want to bring one back with you! 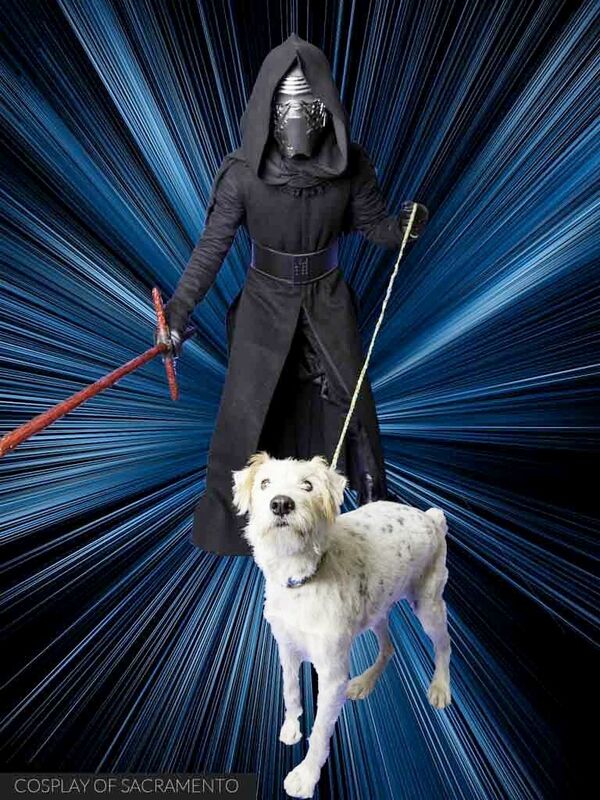 All the photos I submitted to the SPCA had this hyper-drive background. I wanted to replace the blue background that I brought because it ended up being a bit too small to cover everything behind the subjects of the photo. It's a bit cheesy and reminds me a little bit of a Topps Star Wars card insert - but I think that's what I was kind of going for. You can see all the photos from this shoot by CLICKING HERE. 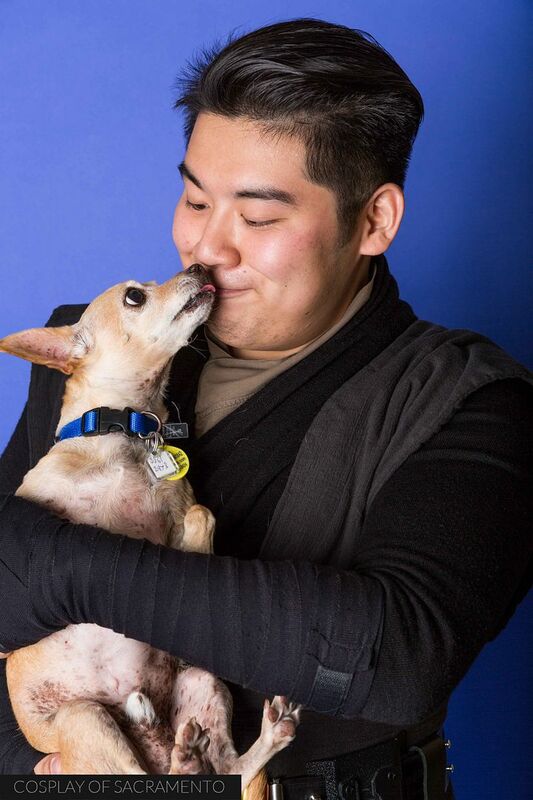 After you see the gallery, check out the Sacramento SPCA if you have even an inkling of wanting to adopt a dog, cat, or other animal. So many animals there are looking for a caring owner - and that could be you! 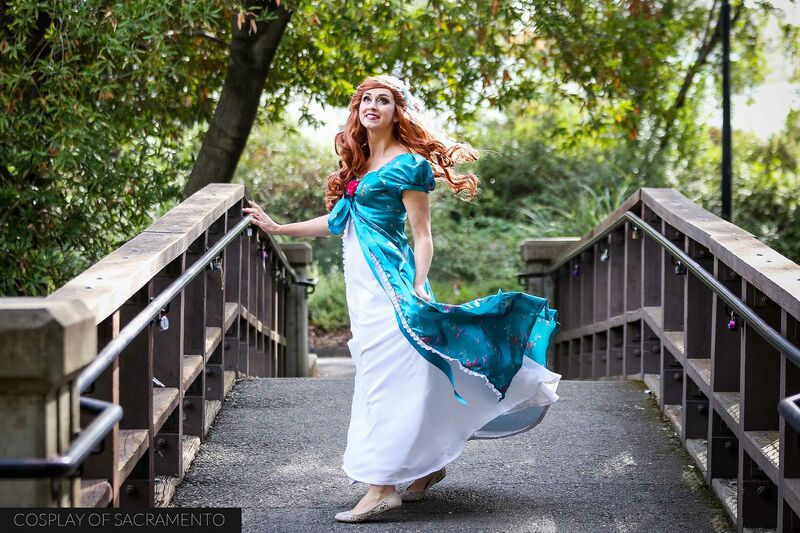 As you know, this past weekend I covered Sac-Con, but before that @Novembercosplay on Instagram and I went out early on Saturday morning to take some photos of her new Enchanted cosplay. We had initially calendared to meet up the week before, but rainy weather pushed it back. It was hard for both of us to get up early on the weekend for this photoshoot, but I think the results of the shoot were totally worth having to do that. For this photoshoot I took the opportunity to try a new toy that I had recently picked up - a Sony a7r mark ii camera. For all you camera nerds out there, you'll know that Sony has taken the camera world by storm with their new full frame mirrorless cameras. I brought the a7rii and paired it with a 55m 1.8 prime lens and gave it a whirl. I went pretty bare bones with the Sony and shot natural light. The photo above was taken with my new baby! I was loving the 55m 1.8 lens on the Sony, but for most of the shoot I went back to using my trusty Canon 5d mark iii. That camera afforded me a lot more flexibility as I had both the 24-70 2.8 and 70-200 2.8 to play with. And not only that, the Canon had the help of a softbox and speed light combination. This shot above was taken at quite a distance away using the 70-200 2.8 L-series lens. 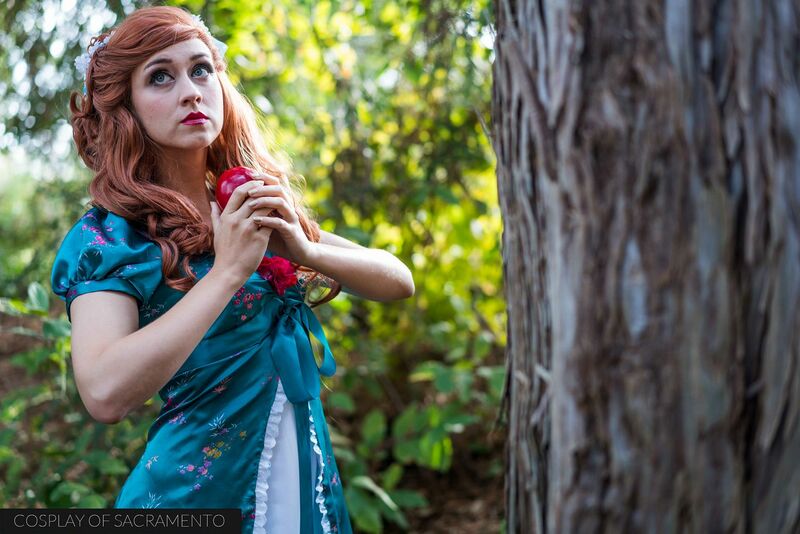 No matter the gear that you have, you have to have a great subject to shoot... and November Cosplay was a stunning subject for me to shoot in the beautiful UC Davis Arboretum. 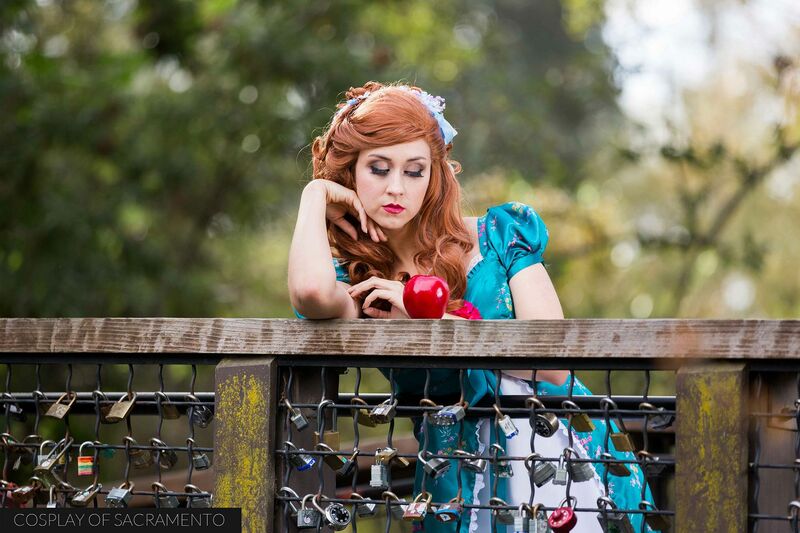 Her Enchanted cosplay looked amazing; she never fails to amaze me with her different cosplays. We had a lot of fun walking through the location and grabbing some beautiful shots. The photo above is one of the last shots we took. Getting a twirling around shot can be a challenge. I think she had to do three sets of twirls before we came up with a nice shot! I'd say that about right! Sometimes I forget to get a photo of myself went I'm out at a photoshoot, but this time I remembered and we were able to grab this selfie after we were done shooting. I'm always up for shooting with November Cosplay. I'm sure you'll see more photoshoots with her in the near future! The actual final photo from the photoshoot was this shot of the back of November's cosplay. 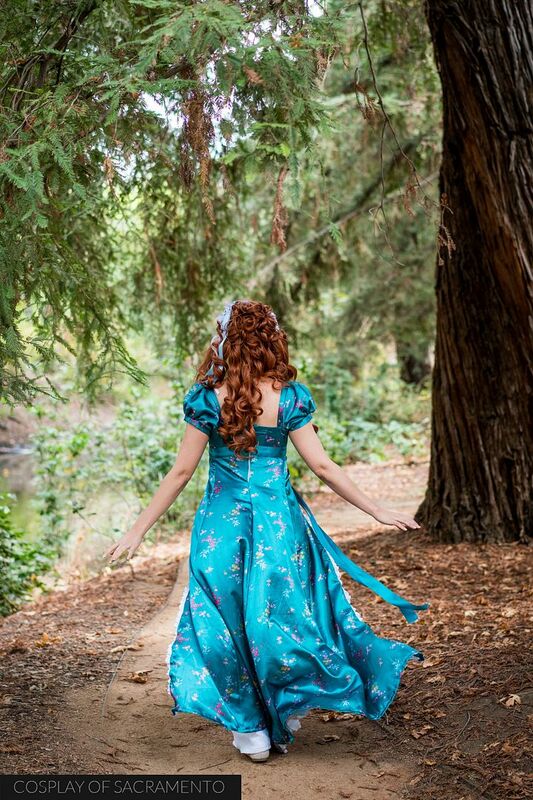 She wanted to get one last shot of the back of the cosplay as she was walking through the wooded area. Please CLICK HERE if you'd like to see all the photos that I captured from this photoshoot. Please also enjoy this short video as well! 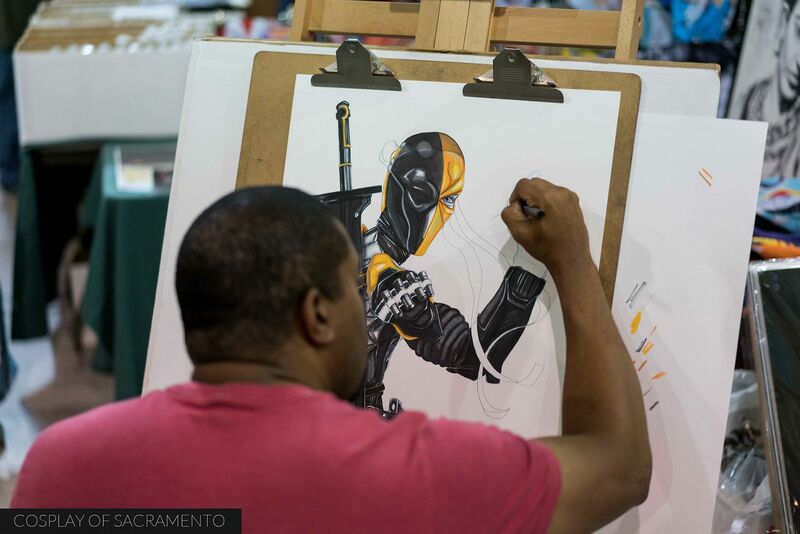 Like yesterday, the artist and vendor hall was full of things happening. Besides having things for sale, you could see artists working on their artwork on the show floor. There is definitely some serious talent here in Sacramento. I loved seeing all the awesome creations that people had on display. I arrived just in time to catch this amazing group of DC cosplayers. If you look closely, you'll notice that there is a punk theme throughout the cosplays in this photo. 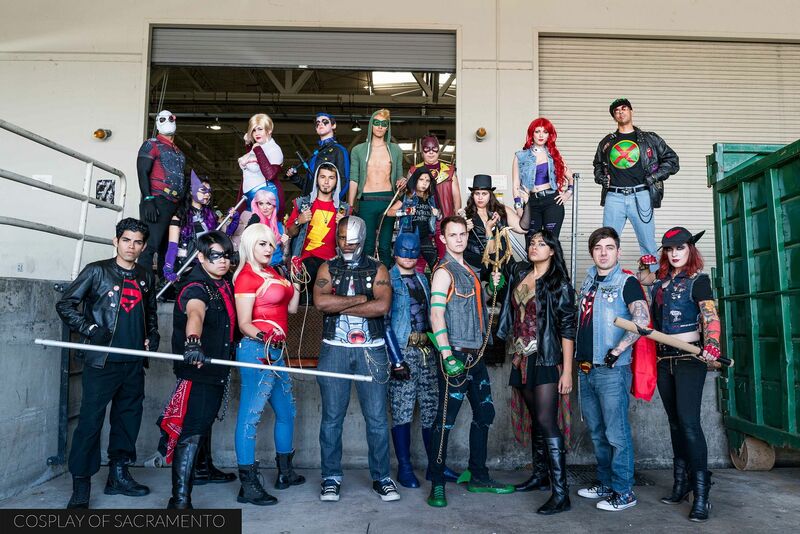 Each cosplayer had their own unique punk take on a DC character. I'm sure it took a lot of coordinating to get everyone in on this! I'm glad I was there to get a few snaps of this amazing collection of cosplays. 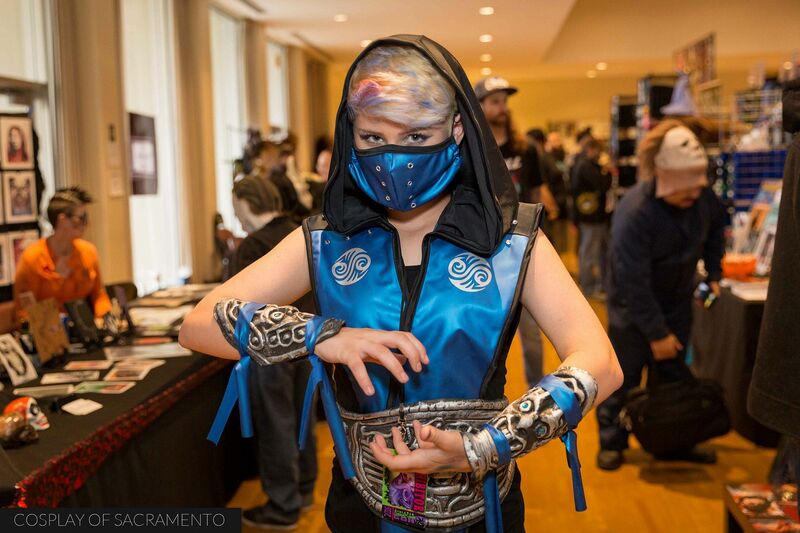 Besides the big DC contingent, there were a great number of really awesome cosplays going on at Sac-Con. 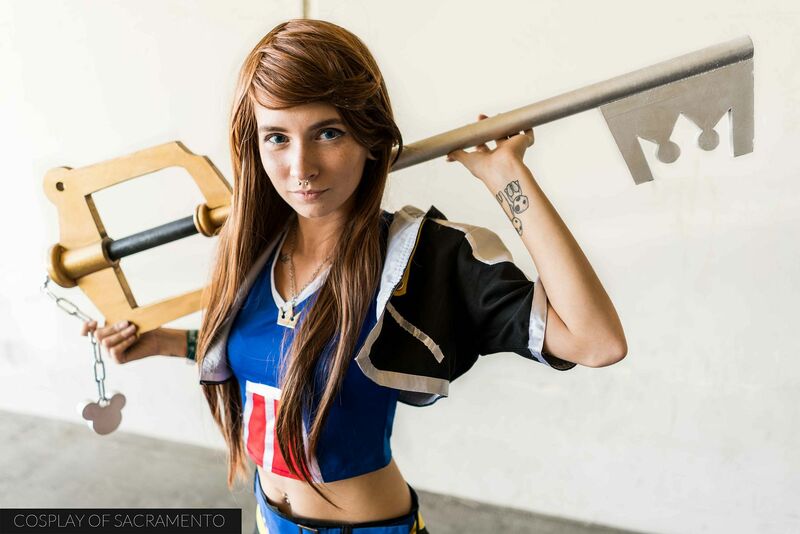 Here's an amazing Sora cosplay from Kingdom Hearts. I really love the huge key prop that goes along with the cosplay - everything about this cosplay looks great! I spent a good amount of time today with the costume contest judges as they looked over and questioned the contestants about their cosplays. I've never had the opportunity to see this before so it was pretty eye-opening. The judges spend a good deal of time meticulously going over every detail of a contestants cosplay. They take their work very seriously! After the judges asked questions of the cosplay contestants they were asked to come to me for a high quality, high resolution photograph. I brought my lighting in and set up shop in a corner of the room to take a photo of everyone who came through. 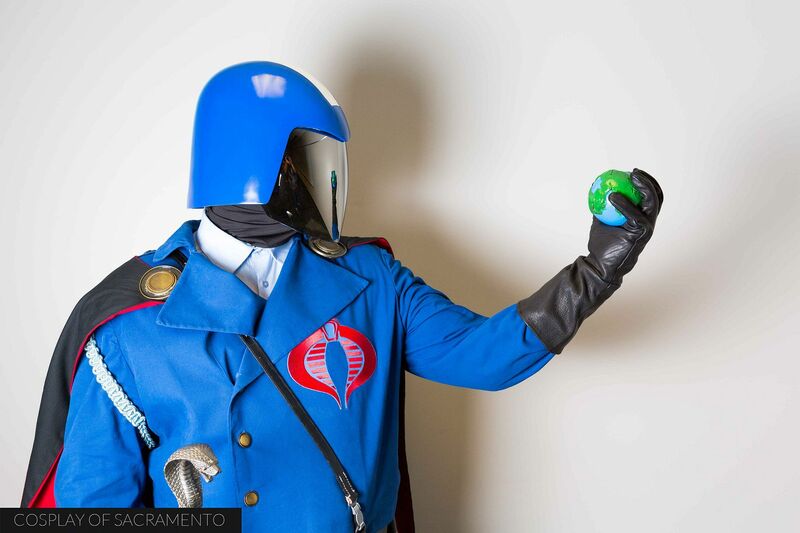 The wall made for a decent plain background as you can see in the photo of Cobra Commander above. I only got to do one photoshoot at the con today, but it was with one of my absolute favorite cosplayers - @necikait on Instagram. We've shot many times before in the past, but lately haven't had the opportunity to get together. 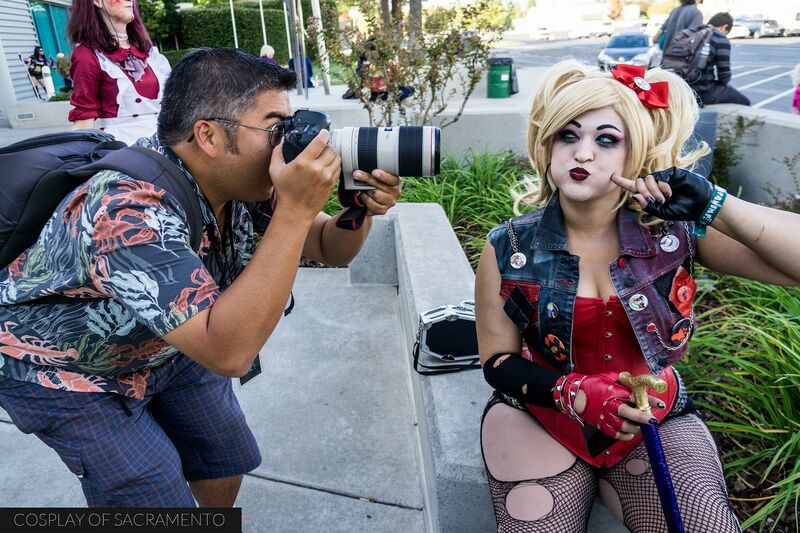 I'm glad could connect at Sac-Con for a few snaps of her Harley Quinn cosplay. 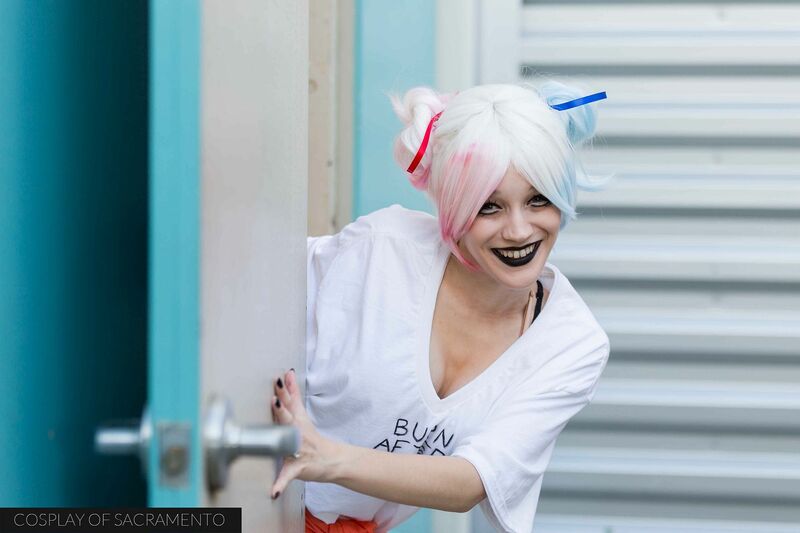 If you'd like to see the full shoot of Harley, the cosplay contestants, and the DC punk cosplayers, check out my day two gallery HERE. 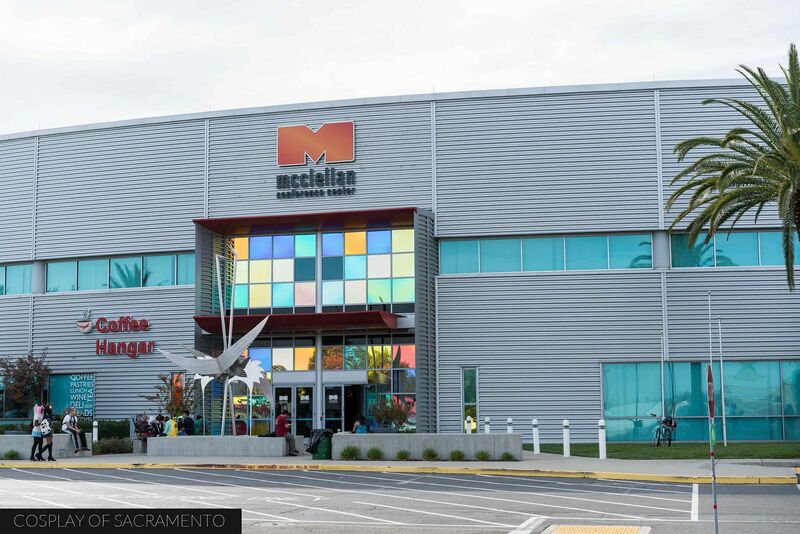 Today I returned to the McClellan Conference Center in Sacramento for Sac-Con! Sac-Con has been held at this location for a while now, so I'm used to coming here for the convention. 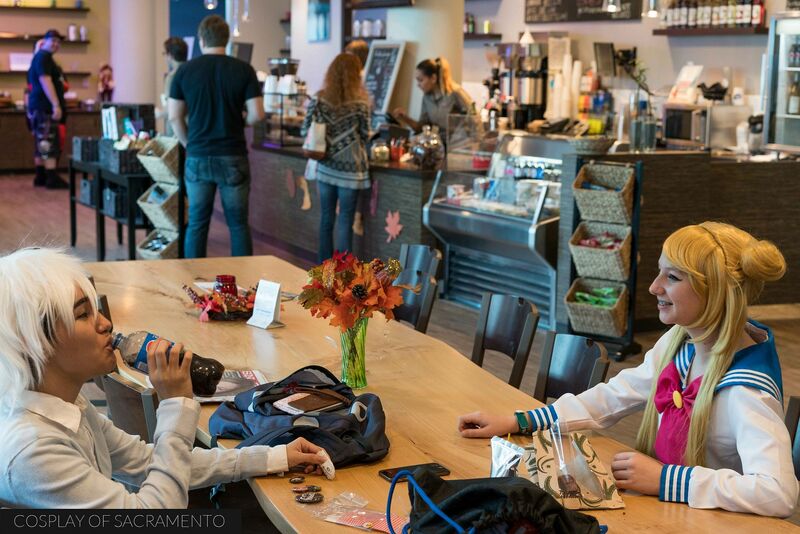 It's a large facility that provides ample space for a con or other large event - and it's the perfect size for Sac-Con. 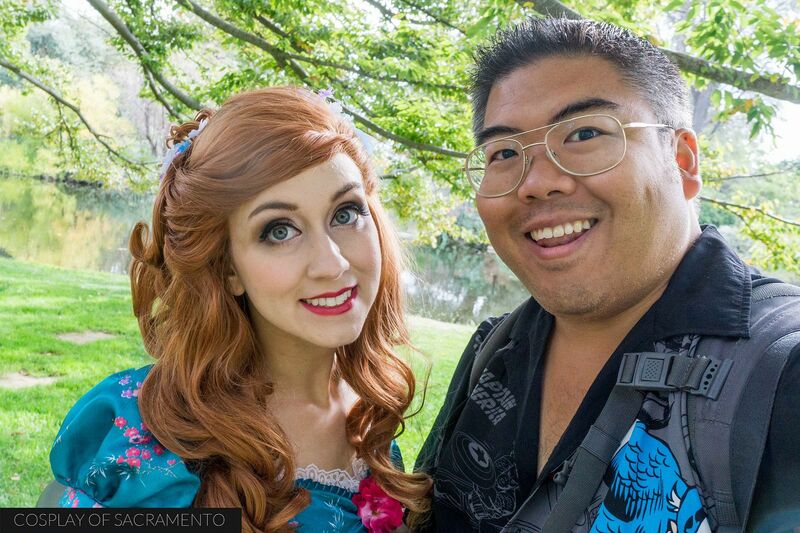 Sac-Con is a medium sized event that has a relaxed vibe which makes it really enjoyable. There is a sizable amount of people who come out, but it is not an overwhelming experience as some other cons may be. It's definitely one of my favorite cosplay/comic events that I attend. 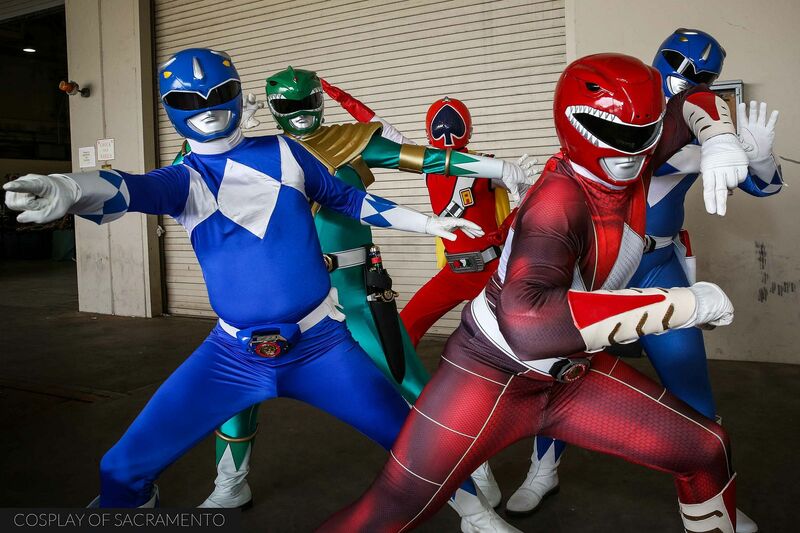 As always, the people of the Sacramento area came out with some great cosplay. 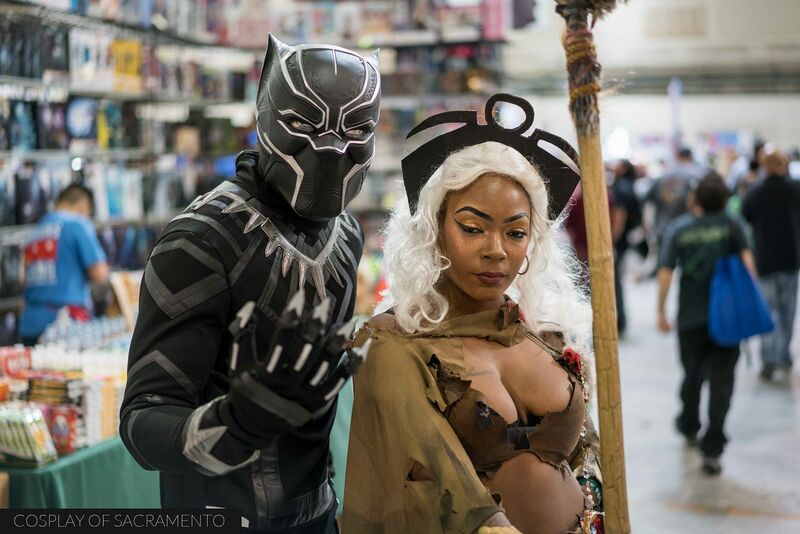 One of my favorites of the con was this Black Panther and Storm duo. I've seen this pair before, and they always come with their A-game. Just check out the amazing detail in both of their cosplays. They are truly incredible. There were lots of people cosplaying today and I had a ton of fun taking pictures on the show floor this afternoon. 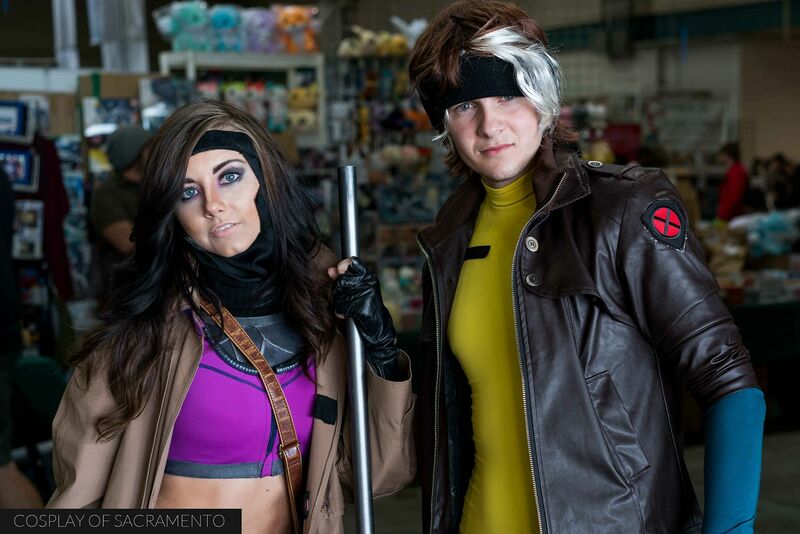 This gender-bend cosplay duo took me by surprise. I'm not sure if I've seen Gambit and Rogue ever done this way before personally. Both of the cosplays look just as they should. Gender-bends are always great to see when done well, and this particular gender-bend cosplay is absolutely great. Doing things like this is very creative in my opinion and I love capturing these ideas as much as possible through photography and this blog. The vendor hall was full of merchants and artists. This particular vendor caught my attention because she was creating items to sell right at her table. 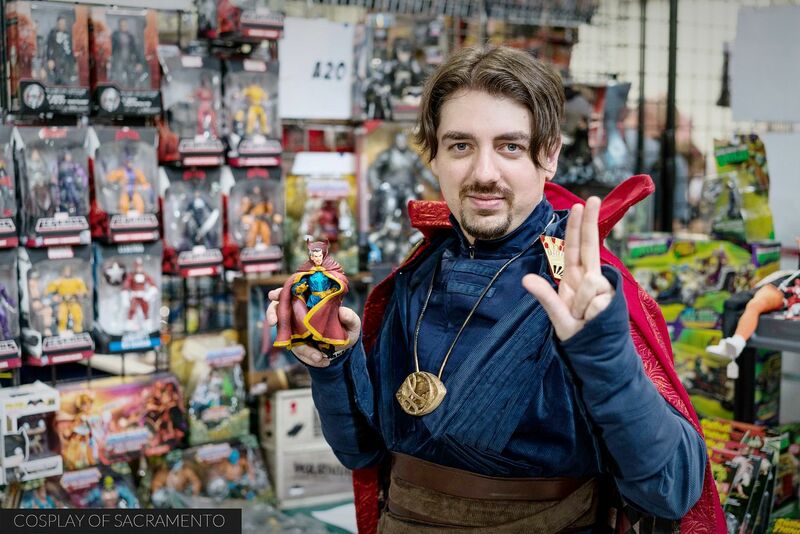 There are a number of merchants and artists who create and sell their unique items at Sac-Con. 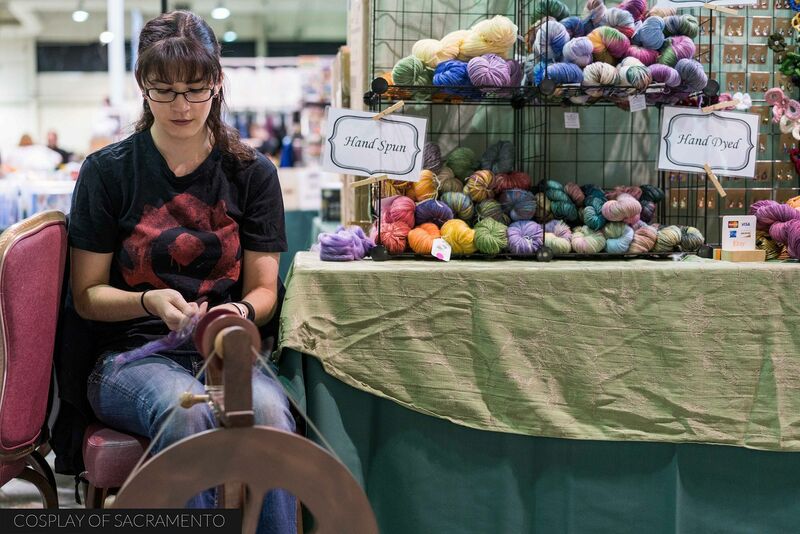 It's worth it just to come to the vendor hall and check out all the one-of-a-kind things that you can buy. Besides items like these, convention goers will find local comic book creators, artists, and writers in the main hall. Don't miss any of them when you come to Sac-Con! Of course if you're into collectibles, Sac-Con has probably got something you want. I personally love toys and figures... and Sac-Con has these items in droves! I have to try really hard to resist spending all my money when I come to events like these. There's just too much good stuff. Items for sale include comic books, video games, and posters amongst other things. Many of the dealers at the con offer good deals on hard-to-find items. You'll see plenty of sale items and items that have been reduced by large percentages. Take your time and comb through the merchant tables for the absolute best prices. Though Sac-Con may not be considered one of the larger cons that happen, it doesn't mean there aren't some great names that come as guests. The entire back wall of the main hall was reserved for honored guests of the convention. 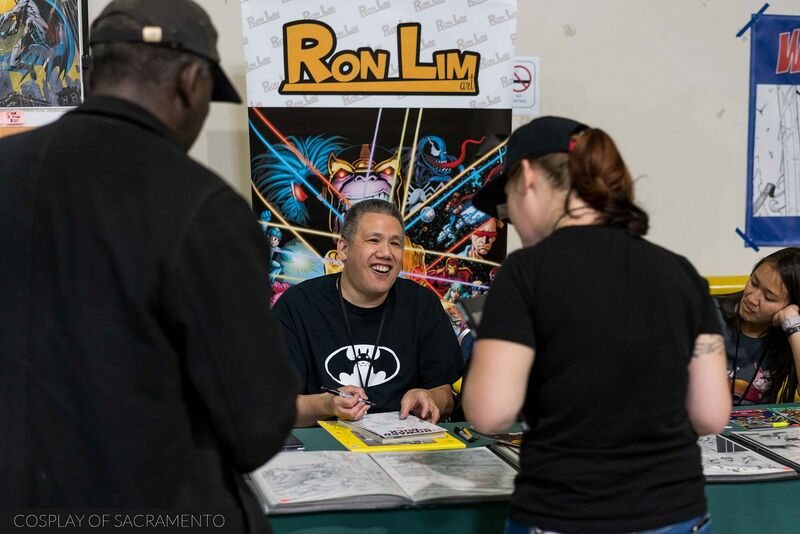 Comic greats such as Ron Lim pictured above were in attendance signing autographs for fans. I fondly remember his work with Marvel when comic books were at their heyday in the 90's. There were many fans who came out to meet Mr. Lim and interact with him. Other guests today included David Yost (Power Rangers), Vincent Ward (The Walking Dead), and Scott Koblish (Marvel Comics) amongst many others. Wanna break from all the con-activities? Sac-Con has a game room full of different video game consoles to play. Yes, there are modern era consoles there, but what I really love are the retro gaming systems. 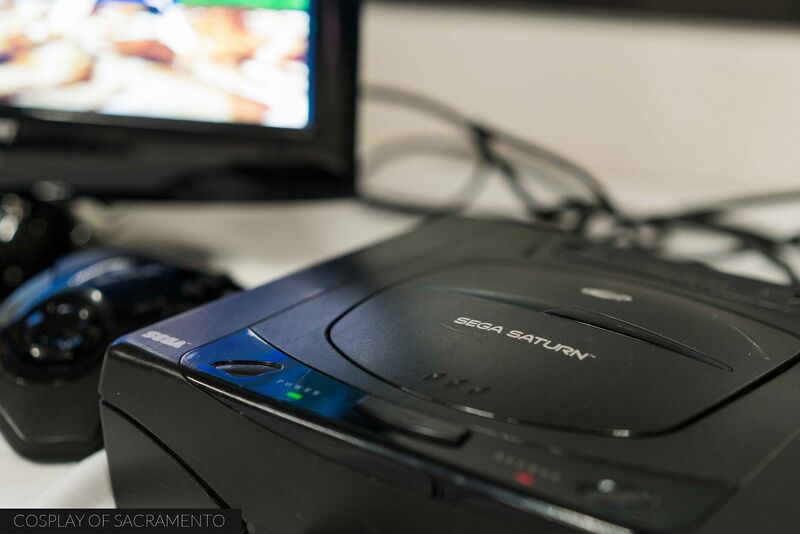 Check out this old Sega Saturn! The Saturn was a very nice system, but it really flopped hard in the United States. I actually had one of these and played Virtua Fighter with my friends after school back in the day. I was really tempted to just put my camera down and spend a good chunk of time in the gaming room... ahhh... but duty called! Had to get back to covering the con! Hungry? Well, that's not a problem. The McClellan Conference Center is fully equipped with a cafe to meet your needs if you get hungry. There are drinks and sandwiches that you can order, and you can relax at a table inside or on a patio. It's actually a very nice set-up to have since the conference center is located in a spot that is a bit away from restaurants and places to get food. Besides the cafe, there was also a section in the con near the patio that also served up food. Sac-Con has your hunger needs covered! As with all cons, my favorite thing to do is take photographs. Just outside the vendor hall is a loading area that is a popular place for folks to go out and get some pics taken. I was able to do a couple of short shoots today - one with a Power Rangers group and the other with a Star Wars group. For a full gallery of photos from the day, CLICK HERE! I was back for day two of 2016 Sinister Creature Con! 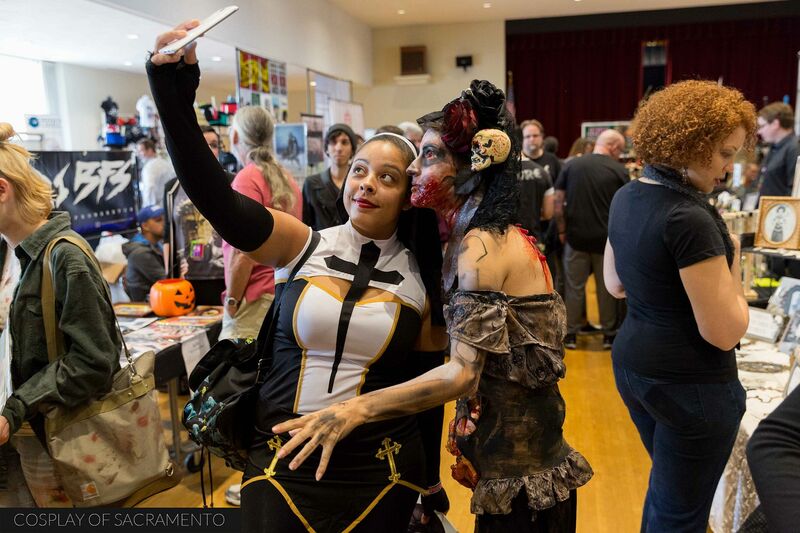 It was a really rainy day, but many con goers braved the wet weather and attended this horror themed second day of the con. Just like the first day, there were plenty of people who came dressed in horror themed cosplay and costumes. One of my favorites was this cosplay family. Everyone had on their scary masks. Is there a saying that says 'a family that cosplays together, stays together'? No? Well... there should be! Especially these guys, there were awesome! Though most of the subject matter at Sinister Creature Con is related to horror and scary things, younger kids were still able to participate and enjoy the whole experience. 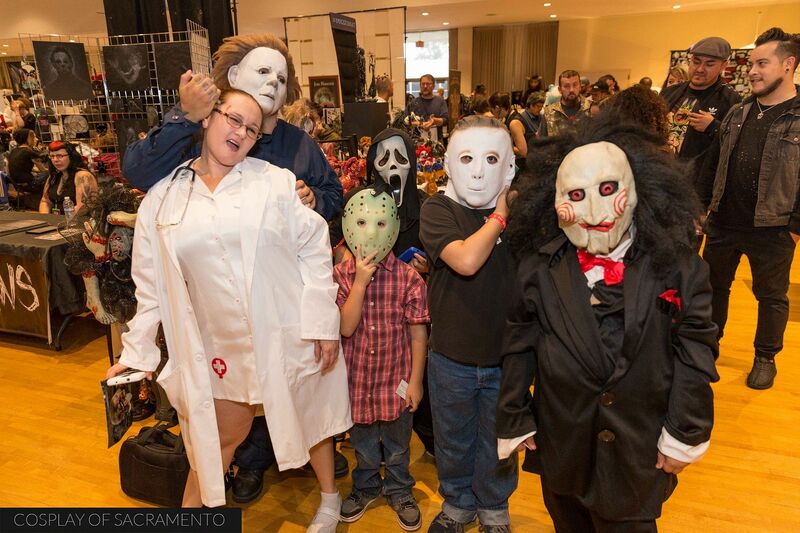 Sinister Creature Con is definitely an event for the entire family to enjoy. 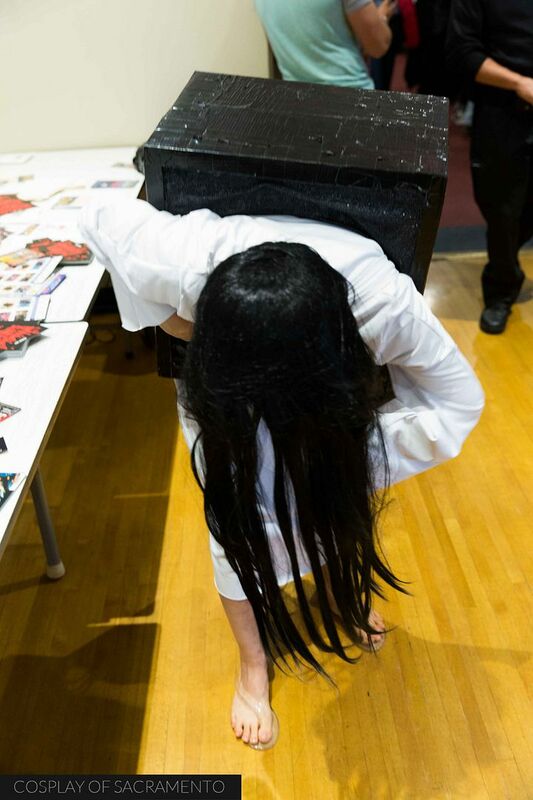 Though this was primarily a horror themed con, there's never any discrimination in terms of the type of cosplay you come with. It was cool to see a mix of video game, comic, and pop culture cosplays alongside the horror themed ones as I walked down the aisles of the vendor hall. It really made for a fun mix to see and be a part of. The celebrity guests at Sinister Creature Con were top notch. 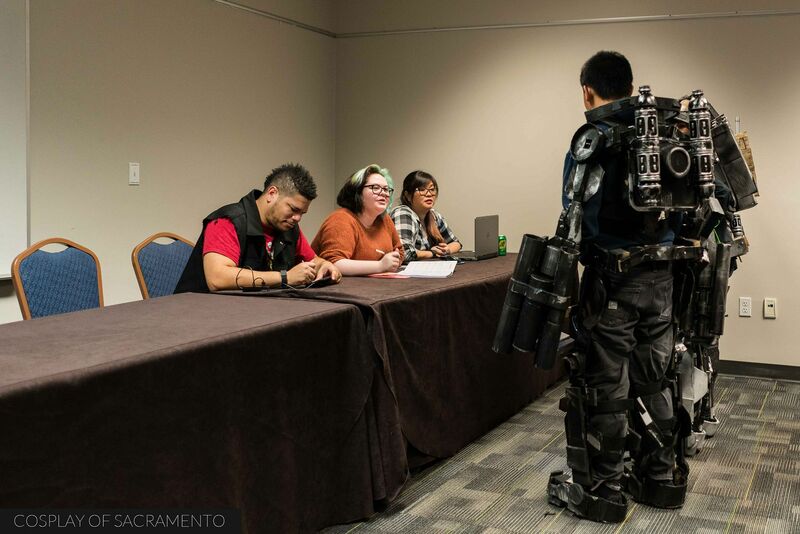 Many of them went the extra mile to talk with and mingle with the con attendees - and that just doesn't happen much at larger cons where they tend to be ushered in and out of appearances as quick as possible. 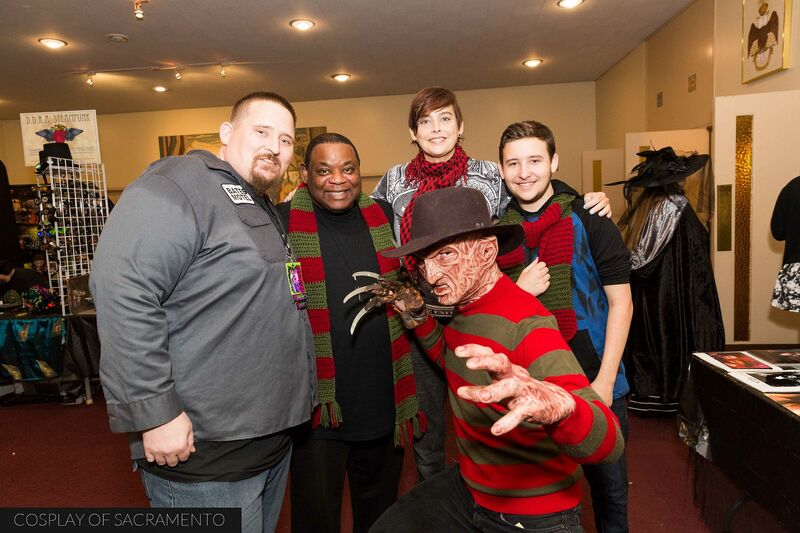 Here's a photo of Ken Sagoes, known for his role in Nightmare on Elm Street III, posing with a group of fans (and Freddy). The guest panels continued on today to the delight of those who came out. Here's Jodelle Ferland at her panel talking with the fans. Jodelle is known for her role in the Silent Hill movie. And as you've probably noticed, there's a pyramid head next to her as she is speaking. Pretty cool! She's also been in a number of other projects including some work done on the Syfy Network. It was awesome to hear about her experiences on set and how geeky she really is in real life! There are two movies that are a MUST WATCH for me now. One is Frankenhooker and Trick 'R Treat. Why you ask? Because I met two actors from both of those movies that were an absolute joy to talk to at the con. Patty Mullen starred in the cult classic Frankenhooker and Samm Todd played a role in Trick 'R Treat. It was sweet to meet them in person, and I think I would get a kick seeing them in the movies they were in. 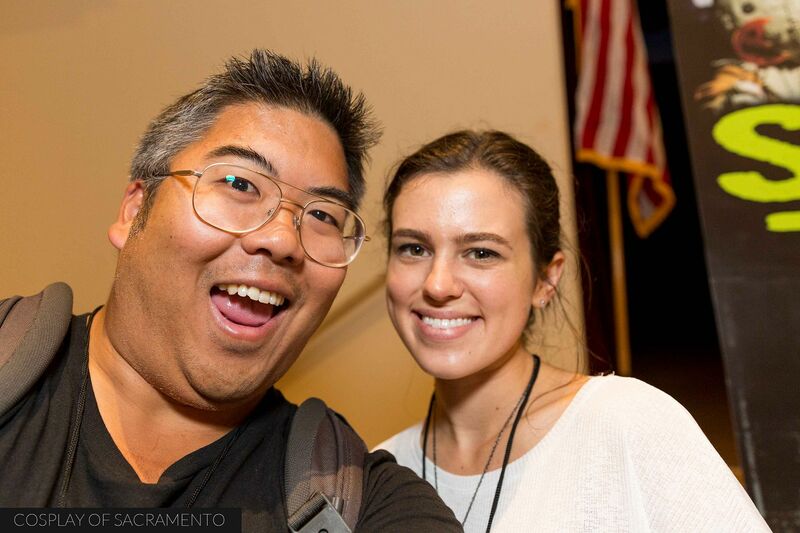 Both of them also took the time to appear in my day two con video! Check them out below! Also, if you'd like to see my photos from day two, CLICK HERE. It's been a month or so since the last cosplay event I've been to... and it's felt like forever! I'm so glad Sinister Creature Con was this weekend so I could get back into the mix. 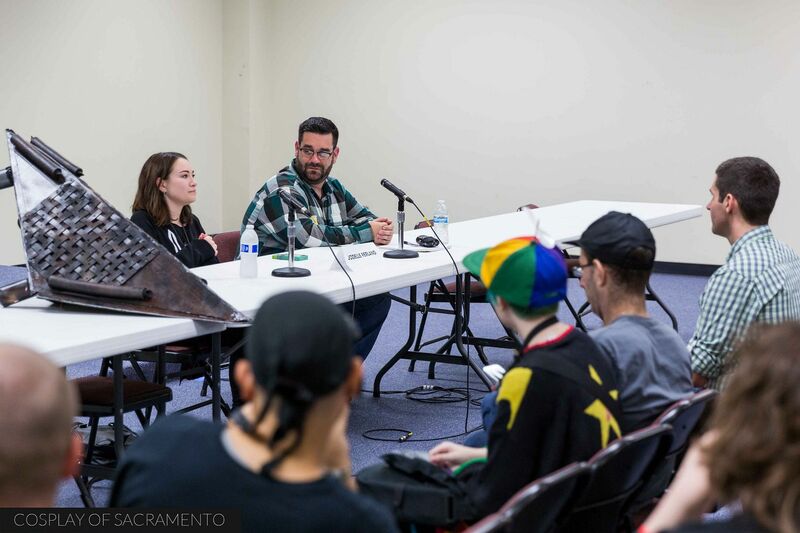 Sinister Creature Con is a unique event for us here in Sacramento. Its focus is on horror rather than comics or anime. 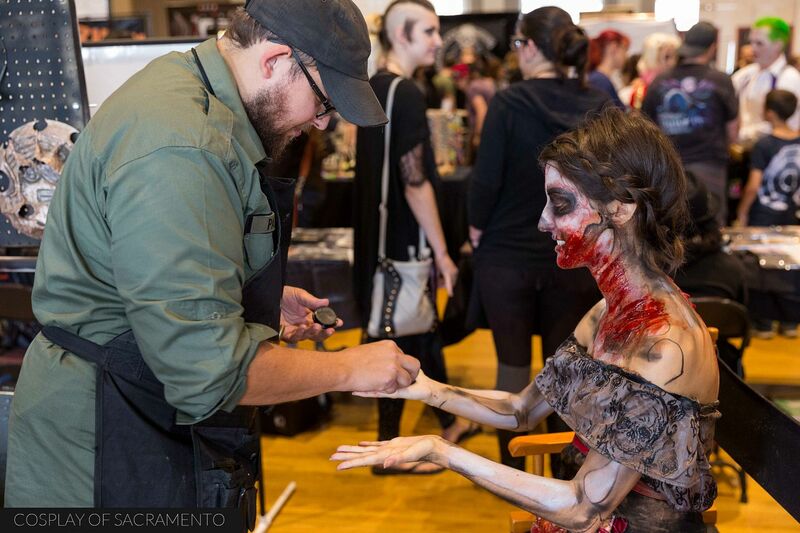 It's awesome to see all the horror fans come out to this con and have the opportunity to get horror make up applied, purchase rare and one-of-a-kind horror/movie items, and meet guests who have been in horror productions. Sinister Creature Con is very well run and provides a ton of fun and excitement for fans of the genre. And even if you're not a huge horror fan, there is a great deal to enjoy here! The folks who came out to Sinister Creature Con had some great costume ideas. I loved seeing all the creativity shown on the show floor. The photo above shows a pretty intimidating girl coming out of a television set. I'm guessing she was going for the scary girl from The Ring. Well, this was pretty spot on! Looking around the con you could see lots of zombies, werewolves, and people with all sort of bloody lacerations. I guess if you're faint of heart this con could be a bit nerve racking. But if you know it's all in good fun, you'll have a blast! I was very impressed with the guest line-up at Sinister Creature Con. There was a very strong line-up of celebrities who got a chance to talk with fans at panels and on the show floor. 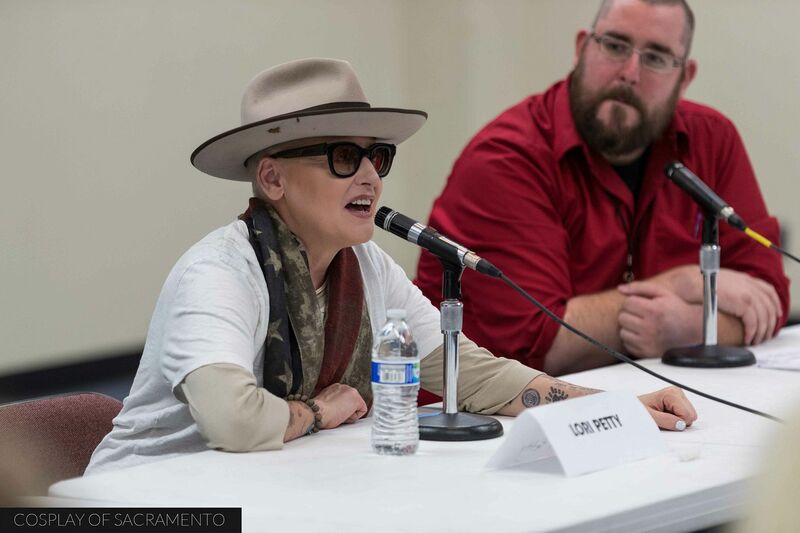 The biggest name who came on the first day had to be Lori Petty. She had roles in major motion pictures like A League of Their Own, Point Break, and Tank Girl and is also currently in the hit series Orange is the New Black. Needless to say, the panel room (which was quite large) was packed to the gills to hear her speak. Other guests included Jodelle Ferland, Samm Todd, and John Kassir - the Crypt Keeper himself from HBO's Tales from the Crypt. There were many more too! I really applaud the people who put Sinister Creature Con together for this great guest line-up. If I can, I love being able to get a mini-shoot done during a con, and today I was able to with Bastian (@crylo.gwen on Instagram). She and her friend came decked out with some pretty freaky blood stains. We had a great time snapping some quick shots. I was able to get some nice zombie poses, strangling shots, and even some going in for a gory kiss (shown above). Like I said, the shoot was quick but I was happy with the results! It's always fun shooting with Bastian and can't wait to do some more pics with her. Day one was great and I was happy to capture a bunch of photos from the con. Check out a gallery of 65 pics HERE. I'm excited to return for day two of Sinister Creature Con as well. I'm looking forward to having a great time and seeing more scary things while I'm out there. Please enjoy the following video I made. It recaps what I saw as I attended the convention.